This set is adorable! I want all of it ha ha! I have been waiting since yesterday for this post! I shared on facebook! I love the Hello Spring line! It is so cute! Can't wait for the matching Doodletwine either! First I'm going to post a link on Two Peas to tell everyone to check it out!!! I'm sure we will both Can't wait for the matching Doodle Twine either! Now I'm going to email my scrappy BFF, Dori! I emailed it to many of my friends! I hope you get tons of exposure and some one us wins! This whole set is amazing! Oh I love this and would love to win it, off to email my friends! I shared this on all the message board that I am a member of on facebook including, bloggin gals, sisterhood of paper crafting, my design teams, blog giveaways, and silhouette users. I would love to win this! I am off to tell all the other moms at my son's preschool so I am hoping you will have tons and tons and tons of exposure and so many entries! oh this collection is gorgeous, I'm so excited for Spring and you have jump started my excitment. Shared on Facebook , would love to win, thank you!! I don't have a Facebook account, but I told my Facebook Friend about this giveaway!!! 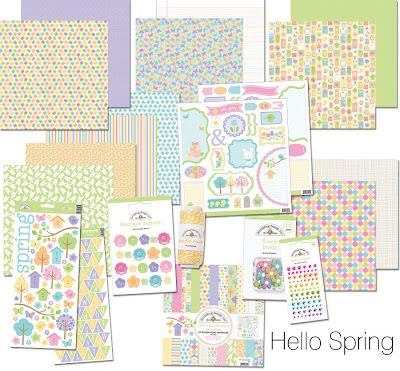 I didn't notice your pics below earlier, I was so excited about the Hello Spring! Love your booth- always the best one at CHA! Shared this on FB too! Shared on facebook. Thanks for the chance to win some awesomeness. I posted a link on my Facebook page. Thanks for the chance to win! Ooooh, shared the cuteness on my FB page! Thanks for the chance to win - this is just so cute, and I love the beautiful booth at CHA! Super cute new spring collection, I love it already. And the new twine color is fabulous! I just pinned this post on Pinterest... hope that gets me entered into the giveaway! Thanks! Such a sweet collection! I shared via email! This collection is just amazing! So cute!! I want it!!! I shared on FB. Love the colors and get wait to get the lilac twine and see what the other new colors are are. CHA is so much fun!! I shared on FB and sent out emails to all my scrappy friends!!! Love you all!! I've shared on Facebook! Happy Monday! So pretty and bright! and yes, one can never have enough twine! Shared with my friend using email! Back to say I shared on FB! I shared on FB.So pretty, love all the beautiful spring colors.Thanks for the chance to win! I shared via email to all my scrappy friends!! Called a scrappy friend and told her to get online too!! I've been waiting to see your new lines...you never disappoint, love it! I have shared on facebook and pinterest. Beautiful collection! Love the Bright colors! I am now a follower, am a fan on FB and I shared your link there as well!! Ok I +1'd it, I blogged it, I tweeted it, and my tweets got to FB- so I Facebook'd it, too!! What fun patterns and colors! I shared on FB! This back is awesome I would love to have something like this. Posted on Pinterest as well. 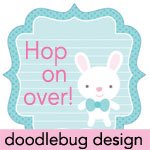 Love Doodlebug! Your buttons are the best. Great release! Thanks for the chance, would love to win! Very pretty!!! I shared on my fb page, too!! I kist can't figure out how to get the right link for you....hmmmmmmm....when I figure it out, I will come back and post! And I shared on Fb!!!! I shared via email with my scrapping friends! I shared on Facebook!!! Thanks for the chance to win! I sent a link to all my girlfriends too look at this adorable collection! So excited for the new releases! Adorable collection! Good luck on your 200 fans! I enabled..err shared with all my scraping friends. Love the fresh spring colors. I twitted about it in English and Spanish at lucynewton13. I posted the link to this blog post on my Facebook page! I shared on FB. Thanks for a chance to win. I shared a link to your new collection on facebook! Thanks for the chance to win the new collection...it is lovely! This is absolutely ADORABLE!! I love it ALL. I am in love with the twine. You are so right.. a girl can never have enough twine. I emailed over 100+ of my crafty friends to let them know about your blog. Thanks so much. Terri of Two Pink Peas www.twopinkpeas.blogspot.com I am also having a great giveaway. Easy entry and low entries. Closes this week. Thanks so much. Am a new follower as well! Cute line! I told my scrappy friends about it! 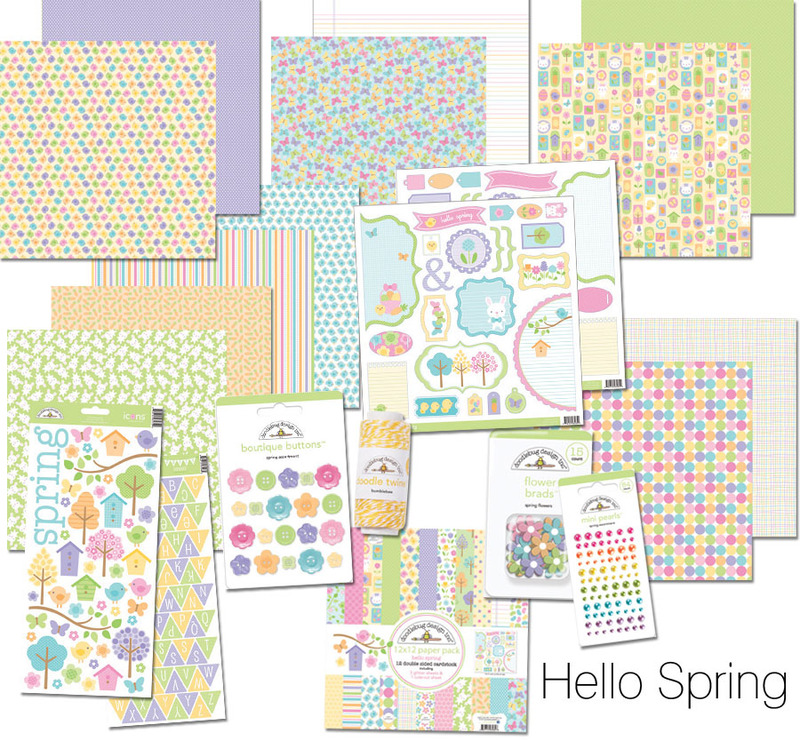 Posted about the wonderful Hello Spring Collection giveaway on my blog sidebar with a link for people to click on to come & enter. I like Spring and would very much like to win. I used doodlebug designs Kitchen Gadgets paper in a Pineapple Upside-Down Recipe Scrapbook Layout I posted 1/31 on my blog. This is so pretty. Shared on Facebook. Thanks for the chance to win some new things! What a sweet collection! Love the soft pastel colors....perfect for those Spring and Easter pics that I still haven't scrapped! I love this paper, just became a new follower. tweeted this here! Love this collection! Emailed out to 5 crafty friends! Love it!!! I texted my BFF, and called my LSS!!!! off to FB it! Shared on facebook! I love the new releases! Pin'd on Pinterest! I can't wait to make cards for OWH with this line. I LOVE IT! Pinned it to my board on Pinterest. That is so cute! Posting on the board to tell all my scrappy friends. Told everyone to check it out through email. Love it all!! So darling, can't wait to use it! I shared it on facebook! I twittered it too! Love it! I also google + it, told you I loved it! I agree, there is never enough twine!! I posted about the new collection on my blog! I emailed my scrapping pals about this. I told my friend about this line too! New line looks great. sent out an email!